Some 300 Jewish worshipers, including representatives of Women of the Wall and their supporters, who arrived at the Kotel Sunday morning in order to conduct a public prayer at the site, were met by protesting haredim, who were brandishing banners and singing against the women's presence at the holy site. The female worshippers arrived at the site to mark the first day of the Hebrew month of Tammuz, in a Rosh Codesh (first day of the month) prayer. Police arrested two haredi protestors after they allegedly threw eggs and a bottle toward police officers. 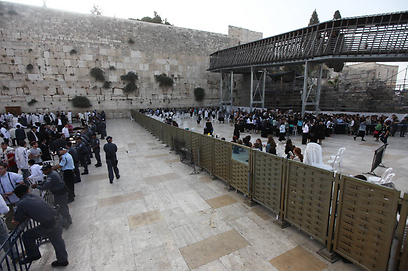 Police and Border Guard created a buffer zone between the haredim and the female worshippers, who were praying and singing, generally undisturbed, excluding a few eggs thrown in their direction. The ultra-Orthodox protesters gathered a few meters away from the women, holding signs that read "Women of the provocation, you've invented a new Judaism; get yourselves a new Kotel as well." Despite rabbis' instructions to avoid clashing with the women, following violence that ensued in last month's prayer, yeshiva students arrived to protest, crying out at the women to "leave the Kotel." Haredi passersby, however, asked the yeshiva students to leave the premises in accordance with rabbis' orders. "Either pray, or go home," they said. "You're letting them win; stay away from them." 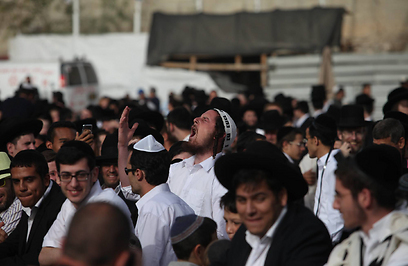 Following the prayer, the women left the courtyard unharmed, though several haredim confronted their supporters in their wake, and some protestors were arrested. MK Michal Rosin (Meretz) attended the Women of the Wall prayer and commented: "This seems like the beginning of an understanding that this place must accommodate different sects. "Nevertheless, I would be happy to see police arrest those who threaten Women of the Wall instead of limiting their movement in a way that doesn't even allow access to the Wall itself." Rabbi of the Western Wall and holy sites, Shmuel Rabinowitz condemned "any kind of violence or protest in the Western Wall plaza," and expressed his hope that "the leadership finds a wise solution until the beginning of next month." Director General of the Women of the Wall, Lesley Sachs, commended the police for doing "above and beyond," to ensure that the women were safe, but nonetheless lamented the fact that they were forced to confine to an enclosed space within the women's section. Reform rabbi Gilad Kariv said he was pleased that the prayer was held without violence and urged the government to "hold discussions with the Women of the Wall and non-Orthodox movements so as to set arrangements for egalitarian prayer." Haredi protesters blamed the police for blocking the entrance to the site, thereby preventing other worshippers from praying in the site. Jerusalem Councilman Yossi Deutsch said it was an "outrage," calling on haredi MKs to bring the issue before the prime minister. "All that was missing is that the police would serve coffee to the Women of the Wall." Police said that in order to ensure the women's safety, the entrances needed to be blocked for a short period of time. 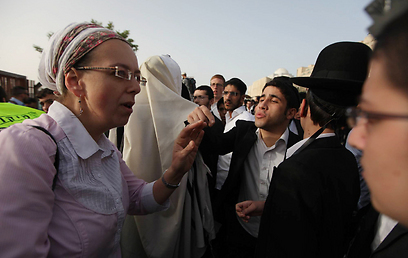 See all talkbacks "Haredim protest against Women of Wall at Kotel"